Voice training in North America owes a lot to the influence of Yoga on our training methods. 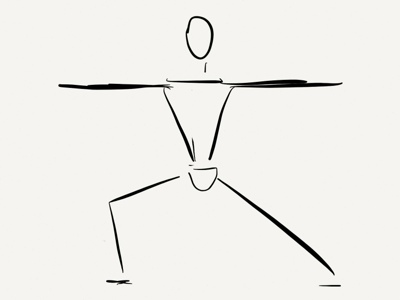 I am anything but a yoga practitioner, but I have to say that my teaching is full of excises that I learned from my main teacher, David Smukler, which are highly influenced by his work in Iyengar Yoga. 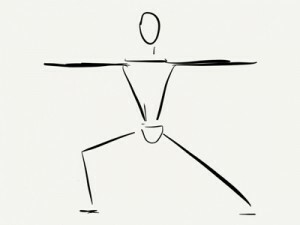 This post will be about an exercise that highly resembles the classic yoga series the “warrior II pose” — Virabhadrasana . If you are unfamiliar with this pose, you might look it up, as the web is full of great examples of yoga teaching. For our purposes, we’re borrowing the base from the warrior series. Bring your legs to a broad stance, with your feet in parallel, about 3-4′ apart. Open your arms up at shoulder height, with your hands flat and palms facing down. ( We’ll start by going to the right in this exercise, so when you repeat the exercise to the left, everything from here on out will reverse. ) Rotate your right foot out to the right, pivoting on your heel. Keeping your torso pointing forward, turn your head to look to the right as well. Bend your right knee so that your knee goes over your right ankle. Your shin should be vertical (NOT like the picture! ), in order not to stress your knee, and your knee should neither turn in or out, but be right above the ankle. This is where we diverge from the traditional yoga poses. (Of course, I suspect that this is also a traditional yoga pose that is defined somewhere, I just can’t find it !) 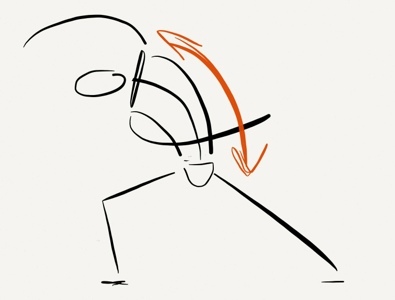 Keeping your pelvis anchored in its verticality, reach your left arm up and over your head while reaching your right arms down and across your body in a circular kind of movement. Meanwhile, curve your spine to the right, as if you were turning yourself into a rainbow. This will stretch out your left side rib cage, and compress your right side. Hang out in the pose for a while (a minute or two? ), breathing into the stretch. When you’re done, bring your arms back to the horizontal while returning your spine back to the vertical. Rotate your right foot back to face front, hop your feet back together, and lower your arms. Take a moment to feel the difference between your left side (which should feel more free and easy) and your right. Now go back two paragraphs and do the whole thing to the left. The beauty of this kind of “rib awakening” is that, once you’ve explored your rib muscles through this kind of stretch, they are much more available to you. Perhaps this is because we often brace ourselves during the day, armouring ourselves from the “slings and arrows” of daily life. Letting go of this habitual tension frees up and lot of breath capacity, and also can make you feel more generally available as an actor. This is a great exercise to add to your process, and particularly helpful right before a big, emotionally demanding scene. I might add it to a sequence like any of the warm-ups on this site, right after the soft palate work.